The Barossa Valley begins some 50 kilometres east of Adelaide at Gawler and stretches for 40 kilometres towards Stockwell and Truro, further east. It encompasses the Towns of Nuriootpa, Tanunda, Angaston, Lyndoch and Gawler, and a few smaller towns set in the rolling valleys of the northern reaches of the Adelaide Hills. 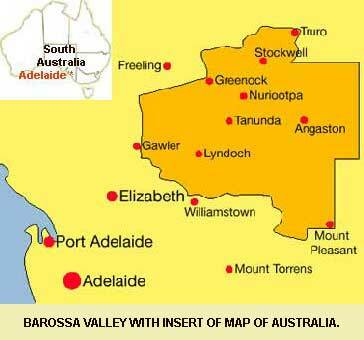 The Barossa, which encompasses Barossa Valley and Eden Valley, has a thousand faces, each of them charming. Lutheran churches in landscapes of natural beauty lovingly reshaped by six generations of the descendants of the English and German settlers who came here in 1839. It was the foresight of these early German settlers who recognized the suitability of the climate and soil to the production of wine grapes. Today the Barossa Valley is one of the world's major producers of fine table wines and there are dozens of wineries creating varied products for you to sample. The Barossa, is a marvellous place to visit, an intimate place of charming old towns, with the vineyards spreading across undulating hills in well tended, precise rows. The Barossa climate is broadly Mediterranean with cool to mild winters and warm to hot summers. Spring and autumn are delightfully mild and some winter days can be quite crisp. We provide a unique alternative to service club membership and we have a few, interesting projects on the boil, and in keeping with the club ethic they are humanitarian, fun and manageable.